What can you do with EMC Enterprise Hybrid Cloud? Enterprises and service providers are moving towards virtual data centers, or cloud architectures, or the new Software Defined Data Center to gain benefits in terms of agility, efficiency, and cost control. Move to these dynamic, virtualized, cloud architectures is creating new challenges for the management teams who are responsible for ensuring service availability, performance, and compliance. They got to choose either the speed and agility of public cloud services or the control and security of private cloud infrastructure. Over the past few years, IT organizations have been working both with private and public cloud offerings. Bringing together the advantages of private and public cloud was difficult because lack of interoperability across different platforms to poor visibility as there were separate processes and tools. EMC Hybrid Cloud solution brings the best of both the worlds that can broker services between private and public cloud. It provides visibility and control over the where the business applications are hosted. EMC Hybrid Cloud is not a product but a solution pre-integrated, complete Federation stack of products that can be installed and implemented in as little as a few days by following the step by step instructions published by EMC. Hybrid Cloud Reference Architecture was developed through extensive interoperability testing and EMC’s expertise in hybrid cloud deployments to speed adoption of a hybrid cloud. These defined standards provide enterprises with a fully integrated cloud infrastructure by identifying their specific use cases and applying them to the predefined solution. Self-Service Storage: Self-service access to storage resources enables rapid turnaround for enterprises. This also should provide multiprotocol support: file, block, object storage. 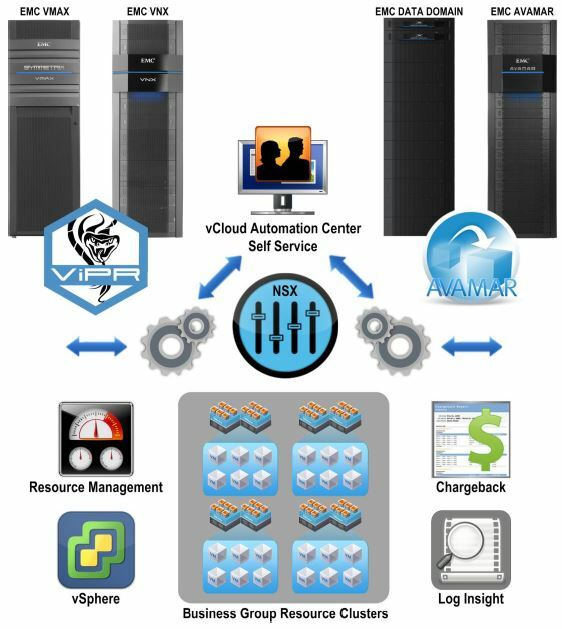 Solution features include VMware vCloud Automation Center, EMC ViPR, and EMC and/or 3rd-Party Storage. Automated Provisioning: Users are offered a portal for requesting cloud resources. This request can be an individual VM, or a complete application stack that leverages multiple VMs, e.g. database, application, and web servers. Solution features include VMware vCloud Automation Center, VMware vCenter Orchestrator, and EMC vCO Workflows. Secure Multi-tenancy: The business cases for multi-tenancy are end users in the IaaS cloud can request virtual machines that are isolated from other cloud users and enables support for specific compliance, security, and regulatory needs. Solution features include vCloud Automation Center, vCloud Networking and Security, and VMware NSX. Data Availability and Protection: Efficient use of data availability and protection provides operational savings. Users can set their own data-protection policies and report on the protection status of their own data. Data protection policies can be enforced with corporate or regulatory backup and recovery policies. Solution features include VMware vCAC, VMware vCenter Orchestrator, EMC Avamar, and EMC Data Domain. Automated Monitoring: Automated monitoring ensures that not only capacity, performance, and health monitored, but also alerts are issued intelligently. It thus reduces the noise of a monitoring system to maintaining uptime and service level agreements. Solution features include VMware vCenter Operations, EMC ViPR Storage Analytics, and VMware Log Insight. Transparent Pricing: Financial transparency of service cost is essential to reduce the wastage of virtualized resources. Resource and group-level chargeback services should be available to users for what they use. Report on usage and cost metrics will help IT to plan well. Solution features include VMWare IT Business Management and vCenter Operations Manager. This entry was posted in Hybrid Cloud and tagged 3rd Platform, EMC, Hybrid Cloud. Bookmark the permalink.